1. Geometric transformations and notions of symmetry can be used to both visualize and prove properties of many figures including: traversals, isosceles triangles, various types of quadrilaterals, and more. 2. Validate others always. Today I had the experience of being in a working group whose ideas were invalidated shortly after they were presented to the class, and suddenly all the math anxiety of my high school career came flooding back to me. 3. While post-it note poster paper is great for groups to write on and present with, it’s expensive and often goes to waste if a student makes a mistake. Instead, I am going to make giant whiteboards, 2 ft by 3 ft. I envision putting them on the chalk sill or window sills and letting students use them whenever students ordinarily need poster paper. Students will be able to erase mistakes easily, and the boards will serve as a good student work decoration when not in use. 4. In order to visualize 4D objects, it is useful to first think about how can represent 3D with a 2D projection. 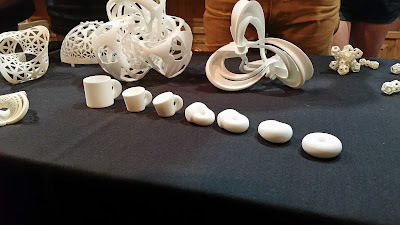 Thus, we can represent a 4D object with a 3D projection, and then print off the projection with a 3D printer/ Of course, some projections are better representations than others and it’s important to study those projections. 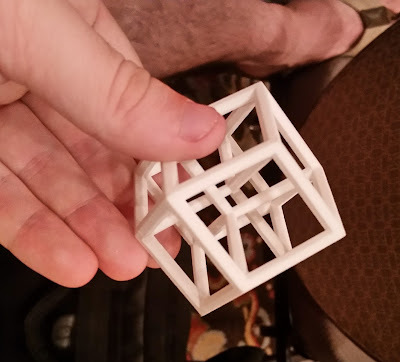 Also, 3D printing is just generally pretty cool. 6. (Friday Bonus) Give It Away by the Red Hot Chili Peppers is not a good karaoke song. Sugar We're Goin Down by Fall Out Boy is also not a good karaoke song. But, I Want It That Way by the Backstreet Boys is an excellent karaoke song - especially when it comes with an open invite to all male math teachers.